City of Peterborough's Ross Ambler on the ball during the English Hockey Cup win over Henley. Photo: David Lowndes. City of Peterborough made history yesterday (November 15) by reaching the last eight of the English Hockey Cup for the first time. The city side crushed Southern Premier League side Henley 5-1 at Bretton Gate to book a semi-final date away to Banbury in February. Ross Ambler of City of Peterborough takes the ball between two Henley defenders. Photo: David Lowndes. And City would appear to have a great chance to reach the semi-finals. Banbury are two places lower than Henley in their regional league, although they have despatched three National League sides, including Premier Division side Canterbury yesterday, on their way to the last eight. That’s a concern for another day though, For now City, who had recorded their biggest East Premier A Division win of the season 24 hours earlier by smashing Bluehart 7-0, can bask in some well deserved cup glory. City dominated Henley from start to finish, passing the ball about with supreme confidence all over the park. 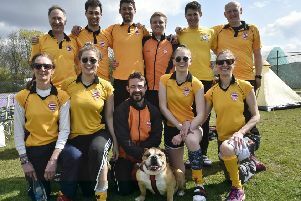 City are a very fast and fit side, capable of playing high intensity hockey, and had too much for a Henley side who were possibly less equipped fitness-wise to handle two games in a weekend. Ben Read opened the scoring after 15 minutes from a short corner and it remained 1-0 at half time. Henley offered more of an attacking threat in the second half, but this was the spur for City to find another gear, knocking in four field goals from Read again, Aussie Robbie Muir (2) and Shane Vincent, to take the scoreline to 5–0. Henley were gifted a late short corner consolation short corner strike, as City’s standards dropped at the end with the cup tie well and truly secured. Tom Hagues (2), Joe Finding, Sam Anderson, Ross Ambler, Muir and Vincent scored the goals against East Premier A Division bottom club Blueharts on Saturday (November 14). City hit the ground running and were a goal up after only three minutes thanks to a fine open-play strike from Hagues. This set the tone for the first half, with City dominating play, but failing to score again before the break. Blueharts struck a post with a rare foray into the City area. City looked to have more confidence in their own play in the second period and this was rewarded with a number of early open play and short corner chances, resulting in the flood gates opening. It finished 7-0, but it could have been an even bigger margin of victory. This was a great all-round team performance, with the clean sheet valued as much as the goals scored. Hagues was named man-of-the-match.